Organisation Todt (OT) was a civil and military engineering organisation in Nazi Germany from 1933 to 1945, named for its founder, Fritz Todt, an engineer and senior Nazi. The organization was responsible for a huge range of engineering projects both in Nazi Germany and in occupied territories from France to the Soviet Union during World War II. It became notorious for using forced labour. From 1943-45 during the late phase of the Third Reich, OT administered all constructions of concentration camps to supply forced labor to industry. 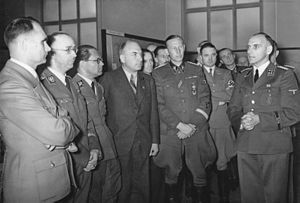 From left: Rudolf Hess, Heinrich Himmler, Philipp Bouhler, Fritz Todt and Reinhard Heydrich listen to Konrad Meyer at a Generalplan Ost exhibition in Berlin, 20 March 1941. The history of the organisation can be divided into three phases. From 1933 to 1938, before the organization existed, Fritz Todt's primary office was that of the General Inspector of German Roadways (Generalinspektor für das deutsche Straßenwesen) and his primary responsibility, the construction of the Autobahn network. He was able to draw on "conscripted" (i.e. compulsory) labour, from within Germany, through the Reich Labour Service (Reichsarbeitsdienst, RAD). The second period lasted from 1938, when the Organisation Todt group proper was initiated, until February 1942, when Todt died in an airplane crash. After the invasion of Poland, Todt was named the Minister for Armaments and Munitions during 1940 (Reichminister für Bewaffnung und Munition), and the projects of the OT group became almost exclusively military. The huge increase in the demand for labour created by the various military and paramilitary projects was satisfied by a series of expansions of the laws concerning compulsory service, which ultimately obligated all Germans to arbitrarily determined (i.e., effectively unlimited) compulsory labour for the state: Zwangsarbeit. From 1938–40, more than 1.75 million Germans were conscripted into labour service. From 1940–42, Organization Todt began its reliance on Gastarbeitnehmer (guest workers), Militärinternierte (military internees), Zivilarbeiter (civilian workers), Ostarbeiter (Eastern workers), and Hilfswillige ("volunteer") POW workers. The third period lasted from 1942 until the end of the war in 1945, when Albert Speer succeeded Todt in office and the OT was absorbed into the renamed and expanded Reich Ministry of Armaments and War Production. Approximately 1.4 million labourers were in the service of the Organisation. Overall, 1% were Germans rejected from military service and 1.5% were concentration camp prisoners; the rest were prisoners of war and forced labourers from occupied countries. All were effectively treated as slaves and existed in the complete and arbitrary service of the totalitarian state. Many did not survive the work or the war. 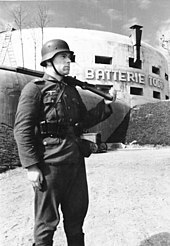 German soldier in front of part of the OT-built Atlantic Wall at Cap Gris Nez, France. The Autobahn concept had its beginnings in the efforts of a private consortium, the HaFraBa (Verein zur Vorbereitung der Autostraße Hansestädte-Frankfurt-Basel), initiated during 1926 for the purpose of building a high-speed highway between northern Germany and Basel, in Switzerland. While the idea did not originate with the Nazis, Adolf Hitler made the decree establishing a Reichsautobahnen project for an entire network of highways, issued on 27 June 1933. He made it a vastly more ambitious public project and the responsibility was given to Fritz Todt as the newly named Inspector General of German Roadways. By 1934, Todt had succeeded in elevating his office to near cabinet rank. Todt was, however, also an extremely capable administrator, and by 1938, the organization had built more than 3,000 km (1,900 mi) of roadway. The Autobahn project became one of the show pieces of the Nazi regime. In that period, Todt had also put together the administrative part of what would become the Organisation Todt, properly speaking. Initially, the Autobahn project relied on the open labour market as a source of workers. Germany was at this time still recovering from the effects of the Great Depression and there was no shortage of available labour. As the economy recovered and the supply of labour became a more serious issue, the OT was able to draw on conscripted (i.e., compulsory) workers, from within Germany through the Reich Labour Service (RAD) from 1935. As per the law of 26 June 1935, all male Germans between the ages of 18 and 25 were required to perform six months of state service. During this period, the work was compensated, at a rate slightly greater than that of unemployment assistance. The working conditions of the labour force would change drastically for the worse over the course of the following ten years. The OT was not given an official name until Hitler did so soon after coming to power during 1933.:5 During 1938 Todt initiated the Organisation Todt proper as a consortium of the administrative offices, which Todt had personally established in the course of the Autobahn project, private companies as subcontractors and the primary source of technical engineering expertise, and the Labour Service as the source of manpower. He was appointed by Hitler as plenipotentiary for labour for the second four-year plan, decreasing Göring's role. Investment in civil engineering work was reduced greatly. Between 1939 and 1943, in contrast to the period from 1933 to 1938, less than 1,000 km (620 mi) of roadway were added to the Autobahn system. Emphasis was shifted to military efforts, the first major project being the Westwall (known in English as the Siegfried Line) built opposite the French Maginot Line and serving a similar purpose. Correspondingly, Todt himself was named Reich Minister of Armaments and Munitions during 1940. During 1941 Todt and his organization were further charged with a project even larger, the construction of the Atlantic Wall, to be built on the coasts of occupied France, the Netherlands and Belgium. Included with this project were the fortification of the British Channel Islands, which were occupied by Nazi Germany from 30 June 1940 to 9 May 1945. The only camps on British soil operated by the OT were in the Channel Islands; two of these OT camps were given to the management of the SS from March 1943 converting them into the Alderney concentration camps. Fritz Todt died in an airplane crash on 8 February 1942, soon after a meeting with Hitler in East Prussia. Todt had become convinced that the war on the eastern front could not be won and thought himself independent enough to say as much to Hitler. As a result, there has been some speculation that Todt's death was a covert assassination, but this has never been substantiated. 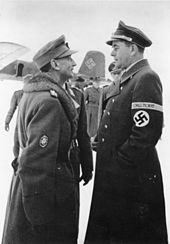 Eduard Dietl and Albert Speer, at Rovaniemi Airport in Finland, during December 1943. Todt was succeeded by Albert Speer as Minister of Armaments and Munitions, and de facto manager of the Organisation Todt. Despite Todt's death, the OT continued to exist as an engineering organisation and was given more assignments. At the beginning of 1943, in addition to its continuing work on the Atlantic Wall, the organization also undertook the construction of launch platforms in northern France for the V-1 flying bomb and V-2 rocket. During the summer of that year, the German war efforts became increasingly defensive, and the organization was further directed to construct air-raid shelters, repair bombed buildings in German urban areas, and construct underground refineries and armaments factories, also termed Project Riese. During 1943, the organization was administratively incorporated into Albert Speer's Ministry of Armaments and War Production. Speer's concerns, in the context of an increasingly desperate Germany, in which all production had been severely affected by materials and manpower shortages and by Allied bombing, ranged over almost the whole of the German war-time economy. Speer managed to increase production significantly, at the cost of a vastly increased reliance on compulsory labour. This applied as well to the labour force of the OT. The OT was a co-operative effort of the German government and the German construction industry; the former supplied the manpower and the material, the latter supplied the technical know-how in the form of individual contractors (OT-Firmen) with their staff and equipment. Up to about 1942 the construction companies dominated the OT, but after Speer became its director, the governments control of the organization increased through standardized contracts and uniform pay scales. The volunteer contracts with the OT were later augmented with compulsory contracts, forcing construction companies to work for the OT. The construction company contracted became a self contained unit within the OT, composed of technical and administrative staff with the skill and equipment necessary to execute the construction tasks assigned to it. Smaller companies were hence combined to form an Arbeitsgemeinschaft. The organization of the OT contractors were standardized though instructions issued by Wirtschaftsgruppe Bauindustrie, the German construction industry association. Among the OT contractors were also construction companies in occupied Europe. French, Danish, and Norwegian companies contracted with German companies as sub-contractors for OT building projects. Cost reimbursement contract, where the materiel and labor was supplied by the company. It allowed a commission of 4½% as the profit of the contractor. Efficiency output contracts, where the materiel and labor was supplied by the OT. The profit was computed on the basis of the wages paid to the contractors own staff. This was the dominant type of contract from late 1942. During 1942 a centralized organization of the OT was created when Speer became Reichsminister. A new HQ in Berlin, Amt OTZ, was created with Ministerialdirigent Franz Xaver Dorsch as chief of staff. It merged during 1944 with Amt Bau-OT to form Amt Bau-OT Zentrale directed by Speer, and with Dorsch as chief, representative of Speer as minister, and as general plenipotentiary for construction. 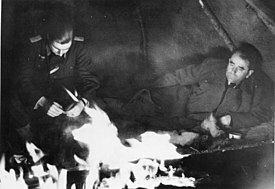 Albert Speer (right) in Finland during the winter of 1943–1944. Area control staffs Army Group level. This section is about Organisation Todt administrative units. For the main article about Einsatzgruppen, see Einsatzgruppen. The Schutzkommando was the security guards of the OT, whose mission was to maintain discipline and order among the foreign workers, as well as guarding the OT construction camps, buildings, and other property against enemy activities and theft. During marches the SK guarded the foreign workers in order to prevent escapes; the ratio of one SK-man per twenty foreign workers was used normally. SK-Abteilung (battalion); one or more per Einsatzgruppe. Ordnungskommando, stationary auxiliaries to the Feldgendarmerie. The NSKK supplied the motor vehicle transportation for the OT until 1944. The role of the NSKK began in 1938, with the NSKK-Transportbrigade Todt in charge of motor transportation for the construction of the Siegfried Line. In 1939, NSKK-Transportbrigade Speer was organized and put in charge of the motor transportation for the air base constructions under Baustab Speer within the OT. Foreign drivers were, however, recruited into the Legion Speer, since they - as aliens - could not be members of the NSKK, which was a sub-organization of the Nazi Party. In 1942, Transportbrigade Todt, Transportbrigade Speer, and Legion Speer, was subsumed into an umbrella organization, Transportgruppe Todt, which in 1944 was made into an organization independent of the NSKK, the Transportkorps Speer. Inland waterways transportation was since 1937 the scope of the Transportflotte Speer, the Speer river fleet. Organisation Todt was preceded by the office of General Inspector of German Roadways (Generalinspektor für das deutsche Straßenwesen), operating between 1933 and 1938, responsible primarily for the construction of the German Autobahn network. The organisation was able to use "conscripted" (i.e. compulsory) labour from within Germany through the Reich Labour Service (RAD). The period from 1938 until 1942, after Operation Barbarossa, when the Organisation Todt proper was initiated and utilized on the Eastern front. The huge increase in the demand for labour created by the various military and paramilitary projects was satisfied by a series of expansions of the laws on compulsory service, which ultimately obligated all Germans to arbitrarily determined (i.e. effectively unlimited) compulsory labour for the state: Zwangsarbeit. From 1938-40, over 1.75 million Germans were conscripted into labour service. From 1940-42, Organization Todt began its reliance on Gastarbeitnehmer (guest workers), Militärinternierte (military internees), civilian workers, Eastern workers, and "volunteer" POW workers. The period from 1942 until the end of the war, with approximately 1.4 million labourers in the service of the Organisation Todt. Overall, 1% were Germans rejected from military service and 1.5% were concentration camp prisoners; the rest were prisoners of war and compulsory labourers from occupied countries. All were effectively treated as slaves and existed in the complete and arbitrary service of a totalitarian state. Many did not survive the work or the war. By the end of the war, the Reichsarbeitsdienst service for Germans had been reduced to six weeks of perfunctory military training and all available conscript German manpower diverted to military units and direct military support organisations. From the beginning of 1942 at the latest, their place was increasingly taken by prisoners of war and compulsory labourers from occupied countries. Foreign nationals and POWs were often, somewhat euphemistically, referred to as "foreign workers" (Fremdarbeiter). During 1943 and 1944, these were further augmented by concentration camp and other prisoners. Beginning in the autumn of 1944, between 10,000 and 20,000 half-Jews (Mischlinge) and persons related to Jews by marriage were recruited into special units. **** At wars end, all Org Todt members received blanket amnesty from the Western Allies. 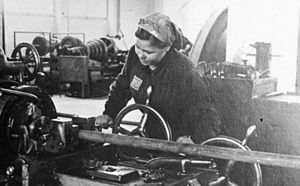 Many went on to serve in the post-war British and U.S. Labor Services in occupied Germany before emigrating to Britain, Australia, Canada and the United States. The U.S. Labor Service was considered the forerunner of the new German army. The Organization Todt itself was found not guilty of war crimes at Nuremberg, although it's leader Albert Speer served 20 years in Spandau Prison after admitting his crimes against humanity. OT-Eigenes Personal consisted of administrative, supervisory, and clerical staff, recruited through voluntary employment of German citizens, or through conscription of Germans and Volksdeutsche, as well as French citizens working for OT in France, and also included Frontarbeiter and Einsatzarbeiter. OT-Firmenangehörige consisted of the German permanent employees of the contractors. as well as conscripts serving with the contracted companies. These employees received uniforms, were given a rank, and were supposed to be given a briefer period of military training. They also included Frontarbeiter and Einsatzarbeiter. Foreign workers, who were either Hilfswillige, East European volunteers, or forced laborers of many nationalities. Germans and Volksdeutsche. Frontarbeiter in OT uniform. Nordics (English, Norwegians, Swedes, Finns, Dutch, Danes, Flemings, Swiss). Frontarbeiter in OT uniform if volunteers. Civilian clothing for local workers in Scandinavia. Hilfsarbeiter if conscripted. Latins and Slovaks. Einsatzarbeiter or Hilfsarbeiter in local uniforms. Russians, Poles, Czech. Hilfswilliger or Zwangsarbeiter. ^ Verordnung zur Sicherstellung des Kräftebedarfs für Aufgaben von besonderer staatspolitischer Bedeutung of October 15, 1938 (Notdienstverordnung), RGBl. 1938 I, Nr. 170, S. 1441–43; Verordnung zur Sicherstellung des Kräftebedarfs für Aufgaben von besonderer staatspolitischer Bedeutung of February 13, 1939, RGBl. 1939 I, Nr. 25, S. 206f. ; Gesetz über Sachleistungen für Reichsaufgaben (Reichsleistungsgesetz) of September 1, 1939, RGBl. 1939 I, Nr. 166, S. 1645–54. [ RGBl = Reichsgesetzblatt, the official organ for he publication of laws.] For further background, see Die Ausweitung von Dienstpflichten im Nationalsozialismus Archived 2005-11-27 at the Wayback Machine(in German), a working paper of the Forschungsprojekt Gemeinschaften, Humboldt University, Berlin, 1996–99. ^ a b c HBC (25 September 2009). "Organization Todt". World War II: German Military Organizations. HBC Historical Clothing. Retrieved 16 October 2014. Sources: 1. Gruner, Wolf. Jewish Forced Labor Under the Nazis. Economic Needs and Racial Aims, 1938–1944 (New York: Cambridge University Press, 2006), published in association with the United States Holocaust Memorial Museum. 2. U.S. War Department, "The Todt Organization and Affiliated Services" Tactical and Technical Trends No. 30 (July 29, 1943). ^ Gesetz über die Errichtung eines Unternehmens Reichsautobahnen Verfassungen.de, n.d.(in German). Note that "law" is the literal translation of the German term, "Gesetz", used in the text of this and other laws of the period. Given, however, that by this date legislative power had already been transferred to the executive (i.e. Hitler), primarily by means of the "authorization law" of 23 March 1933 (Gesetz zur Behebung der Not von Volk und Reich), this, and all other legislation of the Third Reich, was effectively a purely executive order, i.e. a decree (Erlass). ^ One of the quasi-civil projects associated with the Westwall project was the construction of the Hunsrück Highway (Hunsrückhöhenstraße, largely coinciding with the B327 and B407 in contemporary Germany). Its southern end was near Trier, at the border with France and on the wall. The construction of the Hunsrück Highway forms the basis for the fifth chapter of Edgar Reitz' movie, Heimat (1984) and one of its main characters is a (fictional) engineer of the project. ^ Handbook of Organisation Todt (1945). London: MIRS, vol. 1., # 54, 62. ^ Handbook of Organisation Todt (1945). London: MIRS, vol. 1., # 55, 58. ^ Handbook of Organisation Todt (1945). London: MIRS, vol. 1., # 63, 64. ^ Handbook of Organisation Todt (1945). London: MIRS, vol. 1., p. 8. ^ Handbook of Organisation Todt (1945). London: MIRS, vol. 2., p. 184. ^ Handbook of Organisation Todt (1945). London: MIRS, vol. 2., charts 4a, 4b. ^ Handbook of Organisation Todt (1945). London: MIRS, vol. 2., chart 5b. ^ Handbook of Organisation Todt (1945). London: MIRS, vol. 1., p. 9. ^ Handbook of Organisation Todt (1945). London: MIRS, vol. 2., chart 6a. ^ Handbook of Organisation Todt (1945). London: MIRS, vol. 1., # 80. ^ Military Intelligence Research Section (1945). Handbook of the Organisation Todt. London, pp. 77-80. ^ Christian Streit: Keine Kameraden: Die Wehrmacht und die Sowjetischen Kriegsgefangenen, 1941-1945, Bonn: Dietz (3. Aufl., 1. Aufl. 1978), ISBN 3-8012-5016-4 - "Between 22 June 1941 and the end of the war, roughly 5.7 million members of the Red Army fell into German hands. During January 1945, 930,000 were still in German camps. A million at most had been released, most of whom were so-called "volunteer" (Hilfswillige) for (often compulsory) auxiliary service in the Wehrmacht. Another 500,000, as estimated by the Army High Command, had either fled or been liberated. The remaining 3,300,000 (57.5 percent of the total) had perished." ^ Handbook of Organisation Todt (1945). London: MIRS, vol. 1., # 115, 129. ^ Handbook of Organisation Todt (1945). London: MIRS, vol. 2., table 1, pp. 1-5. ^ Handbook of Organisation Todt (1945). London: MIRS, vol. 2., Table V.
Herf, Jeffrey. "The Engineer as Ideologue: Reactionary Modernists in Weimar and Nazi Germany." Journal of Contemporary History (1984): 631–648. Overy, Richard J. "Mobilization for Total War in Germany 1939–1941." English Historical Review (1988): 613–639. Overy, Richard J. "Cars, roads, and economic recovery in Germany, 1932–8." The Economic History Review (1975) 28#3 pp: 466–483. Seidler, Franz W. "Die Organisation Todt. Bauen für Staat und Wehrmacht 1938-1945." 301 pp. Shand, James D. "The Reichsautobahn: Symbol for the Third Reich." Journal of Contemporary History (1984): 189–200. Wikimedia Commons has media related to Organisation Todt. U.S. War Department, "The Todt Organization and Affiliated Services" Tactical and Technical Trends No. 30 (July 29, 1943).